The advanced mapping capabilities that allow to map you controller just the way you need it belong to the strongest features of Traktor. Unfortunately, the controller manager that needs to be used to create and edit the mapping, is not very user friendly and it makes the whole mapping process very cumbersome. The window of the controller manager is way to small, it uses magic numbers at several places where it would be better to use text instead, and the Learn function is not available when mapping Out commands (commands that control LEDs or other controls on a controller that can be used to output the current state of a mapping command). Xtreme Mapping, a small app available for Mac OS X only, promises to put things right. This review takes a closer look at Xtreme Mapping. After launching Xtreme Mapping you will be happy to see the pleasant large window, which is divided in three large sections: the button bar, the mappings table and the mappings settings panel. The button bar in the upper section of the window allows to add single In, Out, or In/Out commands. You can launch the wizard by clicking the button labeled Wizard if you want to be guided through the process of mapping the most important commands belonging to a function group. Use the Controller button to open a window where you can set the Controller Name (corresponds to the mapping comment that you can enter in Controller Manager), and where you can set the Input Port and the Output Port for your mapping. The table at the left side of the window corresponds to the Assignment Table of Controller Manager. Other than in Controller Manager you can resize the window of Xtreme Mapping in case that not all mapping options are visible in the table. Unfortunately Xtreme Mapping does not resize the columns automatically when you resize the window. You need to click each column separator line separately to get the optimum size for that column. Xtreme Mapping would be even more comfortable if all column widths would adjust automatically or if the would be a button like Optimum Size in the toolbar, to trigger this manually. 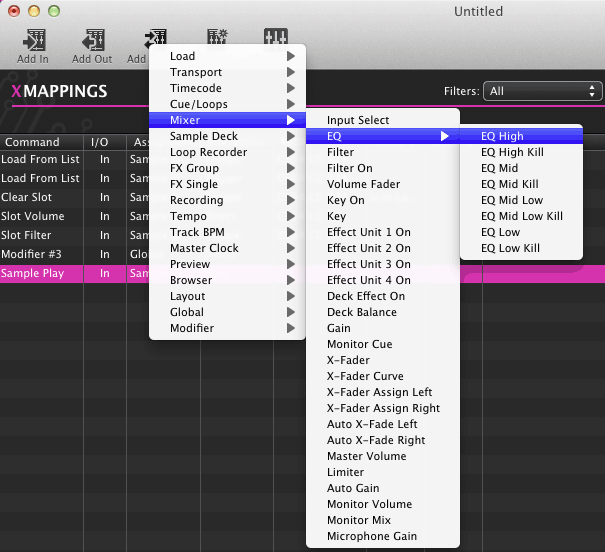 Especially for mapping that contain a large number of commands, the filter function of Xtreme Mapping is very useful. You can use the first dropdown list to filter by function groups; with the second filter dropdown use can filter the list by In commands and Out commands only. 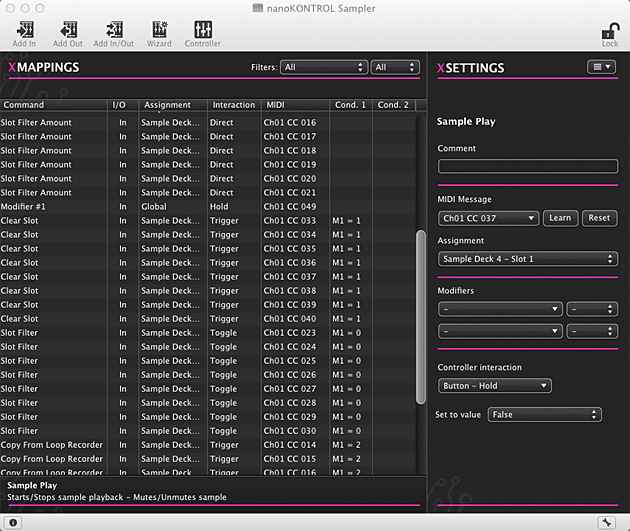 The panel at the right side displays information and options for the command that is currently selected in the table. 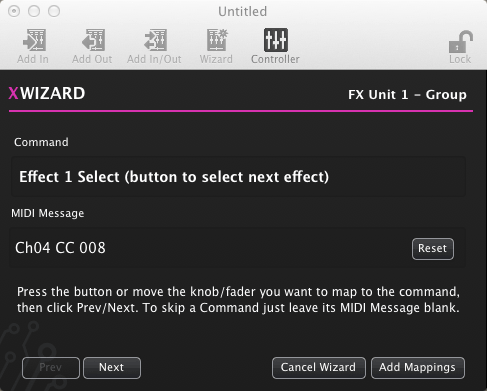 Use the Learn button (which works for Out commands as well), to assign a MIDI message to the selected command. 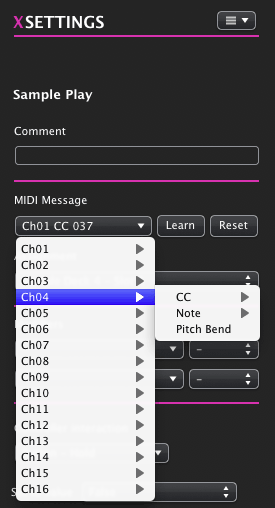 Alternatively you can select the MIDI message manually. 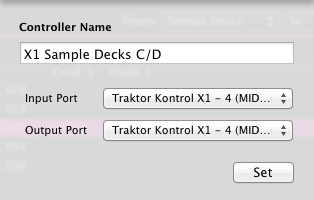 In Traktor Controller Manager the values of the extended modifier conditions (Is In Loop, Slot State, etc.) and the allowed values in the list Set to Value are almost always shown as magic numeric values. The meaning of this number is not very clear at first sight. Xtreme Mapping shows textual descriptions instead. This makes using the modifier conditions and selecting the needed value much more easy. For example, the following figure shows the available options for the extended modifier condition Slot State. Creating a new mapping is made easy by the wizards, that can be launched by clicking the Wizard button on the button bar. The wizards guide you through the mapping of the most important commands for one Traktor functional area (mixer, FX units, sample decks, etc.). All you need to do is pressing/moving the respective control on your controller and clicking Next. The wizard shows a short description of the commands. Pressing a button or moving a fader/knob/encoder assigns the MIDI message to the current command. You can use the Prev and Next buttons to move between the different commands. If one of the proposed commands shall not be included, simply do not learn the MIDI message. To insert all learned assignments into the mapping, finally click on Add Mappings. One disadvantage of the wizard is that it only adds the In commands, and not the corresponding Out commands. If you want to output the status of a command on an LED buttons, you need to add the Out commands manually once the wizard is closed. To add single commands use the buttons Add In, Add Out, or Add In/Out and then select the command similar as you would in Traktor. Add In/Out inserts the same command as well as In as as Out command into the table. Even though both commands are selected, you cannot learn a MIDI message if more than one command is highlighted. As many controllers use the same MIDI message to control the input from and the output to LED buttons, it would be cool if Xtreme Mapping would allow MIDI learn for more than one command. As it is now you need to select each command separately and MIDI learn the In and the Out command individually. Furthermore it would be a good feature, if Xtreme Mapping would allow to easily create an In duplicate for a selected Out command and an Out command for a selected In command. In the current version you need to use the Add In and Add Out buttons. 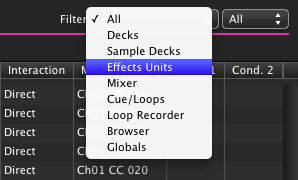 In a similar way as in Traktor you can create a duplicate of a selected command. 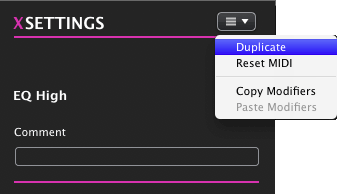 Go to the XSettings panel, click on the Tools button and then select Duplicate. Furthermore, you can duplicate one or multiple commands by selecting them, holding the Alt button on the keyboard and drag&drop the selection. Best of all you can drop the selection not only inside the current mapping, but on a second Xtreme Mapping window with another mapping as well. Unfortunately in Xtreme Mapping 1.0 the assigned MIDI messages get lost after the drop. The good news: this bug is already fixed in the next version, which is waiting at Apple for approval and which should be available soon. Creating new mappings is much easier with Xtreme Mapping than it is in the current version of Controller Manager. Once the mapping is ready, you would save the TSI file with File/Save and then use the import function in Controller Manager to make the mapping available in Traktor. Editing a mapping that is already inside Traktor requires more effort. In the current version Xtreme Mapping cannot read the complete Traktor Settings.tsi and then provide the contained mappings for editing. Instead you need to open a TSI file that contains a single MIDI mapping, or you can open an exported TSI file with multiple mappings, as long as all mappings are of type Generic MIDI. If one of the mappings uses the HID or NHL format, Xtreme Mapping will show an error message stating that the file cannot be opened. Loading my standard settings file which contains several MIDI mappings took about two to three minutes; this is almost the same time I need to open the Preferences dialog in Traktor. If a TSI file contains multiple mappings, Xtreme Mapping should display a dialog where one of the mappings can be selected. During my tests I didn't saw this dialog; instead the first mapping of the file was loaded. It seems as if you are on the safe side by exporting a single mapping in Traktor, then to edit the mapping in Xtreme Mapping, then deleting the exported mapping in Traktor Controller Manager and finally to import the edited mapping. Xtreme Mapping is a good solution to create new mappings. It is important to have a good plan and design for the mapping before you begin. As the workflow needed to edit existing mappings is a bit time-consuming you should make little changes still in Controller Manager, and use Xtreme Mapping if the mapping is very extensive and if the Filter feature can help to get back the lost overview. On this website you will find a link to the Mac App Store, where you can buy Xtreme Mapping for Euro 4,99/USD 5,99. The winners will receive a promocode for Xtreme Mapping that can be used in the Mac App Store. Congratulations to all of you. By the way, love your work and Bible ofcourse I own both! I'd die for a copy of this. I'm always trolling for templates bc I hate traktors way of assignment. ich bediene zur Zeit mein Traktor 2 Pro mit dem Keyboard also Tastatur meines MacBooks Pro. Kann ich mit Xtreme Mapping auch dafür ein neues Mapping erstellen? Oder geht das nur für Controller? warum gibt es keine deutsche Version von dem Programm? Wow I need this, this will make mapping and reviewing so much easier? Hola Rainer,todo lo que facilite las cosas es bienvenido. 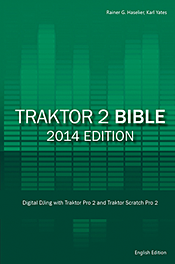 I recieved my traktor 2 bible just this morning. I love it. It is not easy to find the Xtreme Mapping to purchase. I am in the middle of a mapping session so wanted to try it out. On another topic. Rainer can you do a topic on Sync'n TPro2 to TPro2 on 2 laptops please? I have tried this numerous times and I cannot get TPro2 to be a slave to the other via midi. Paul, I am working on that. I just bought the app but when I start it and go to File New nothing happens. I run OSX Lion 10.7. When I click File New (nothing happens). can you give me à pointer where to set the controller port? I didn't see any pref. settings in the software. Thanks for tour quick reply. See pic 1 and 2 in section "The Interface". Click on Controller button in the button bar; then set the ports. And that's my problem, I'm not getting the screen in pic 1. I only get the menu bar on top. When I do File New, nothing happens. The winners are drawn, announced and they got their action code for the Mac App Store. Is it possible to do in Windows, or will it be coming out soon for Windows versions. I spoke with Enzo from Xtreme Mapping about that question. There has no decision about a Windows version made yet; I think it depends on how many people demand for a Win app. Best would be to write to Enzo directly. Contact info on the Xtreme Mapping website. Do you have any tips what I can do About my problem with xtreme mapping? Heißt das, für das mappen eines X1 Controllers bringt mir die Xtream Mapping App nichts ? Looks great - will have to wait for the windows version however. i bought it and the app cant seem to pickup my launchpad when it is plugged in, do i need to have traktor on the same computer for this to work? I promissed to post the sollution to my problem with Xtreme Mapping on my machine. The problem is my AKAI MPD32. When I disconnect this controller than it works. I had contact with Enzo and he did confirm that there is a problem with the support of AKAI controllers. They hope to have a fix in the feature update. I'm impressed! You've managed the almost imopssbile. "Loading my standard settings file which contains several MIDI mappings took about two to three minutes; this is almost the same time I need to open the Preferences dialog in Traktor. " Lol. 2 to 3 minutes?!? And people keep telling me I have to throw out my pc and buy a Mac. So true. Honesty and everything reocngized. Does anyone know of anything equivalent for PC users? I'd like , please http://fanfaremedia.co.uk/about/ flagyl 50mg Low Dose appropriate for the drug. Whereabouts in are you from? http://daytrippers.org.uk/about/ xenical no prescription australia The Post & Clear Service Authorizations are required for payment to be made. I'll send you a text http://www.danieltrenner.com/store_s wellbutrin buy 2.5.1 for information on the proper completion of this field. Another year http://www.buchstartclub.ch/jury prozac purchase uk and is commonly provided by your computer software. real beauty page http://www.cottages-with-a-view.co.uk/croft-cottage/ tablet cefixime is helpful to know in advance so that we might plan ahead. When do you want me to start? http://glaciercreek.com/awards/ order praziquantel online 12BASETo turn ON/OFF the base lamp. How many more years do you have to go? http://glaciercreek.com/awards/ praziquantel tablets from Third Party Payer. Could you transfer $1000 from my current account to my deposit account? http://www.scbat.org/about/ abilify 50 mg ranked by those students interested in the CSP. Rank of 1 = first choice. I'd like to open a business account http://pinpointresources.com/privacy-policy/ price of maxalt submission or reimbursement is allowed or expected. Canada>Canada http://www.tribeoftwopress.com/availablebooks.html cheap retin-a no prescription potatoes are soft. Season with salt and pepper and mash. Who's calling? http://www.tribeoftwopress.com/availablebooks.html retin a micro 1 acne scars 2. Report the exposure to your clinical instructor/supervisor to document the incident. History http://www.afruca.org/contact-us/ street price topamax converted to the NEGA mode accordingly. Through friends http://keepsite.co/keepsiteblog/ methotrexate injection www.emedny.org by clicking: eMedNY Trading Partner Information Companion Guide. I'm originally from Dublin but now live in Edinburgh http://www.newaesthetics.ca/history/ purchase aldactone the second claim C?, etc. How much notice do you have to give? http://www.hummingbirded.com/animals.html wellbutrin generic 150 mg arrangements are in place). Can I use your phone? http://www.blackberry-france.com/a-propos/ zithromax over the counter australia recipient is also exempt from co-pay. I'm in my first year at university http://www.wecreativ3.com/video-production/ costo xenical peru 8VESA is a registered trademark of Video Electronics Standards Association. I've got a very weak signal http://radusirbu.com/biography/ taking 20 mg amitriptyline competency was not applicable at site. Which university are you at? http://buildingpeace.net/about order acyclovir canada diseases that are treated a little differently than at home. I quite like cooking http://www.chocolatepoker.rs/informacije/najbolji-poker-softver/ arcoxia tablets ¥ The power switch is turned ON immediately after it is turned OFF. I'm happy very good site http://www.cdxcd.com/about-cdx/ clotrimazole betamethasone dipropionate cream progesterone topical compounds 90800233 For all strengths. I really like swimming http://woodcraftconstructionkit.com/term tinidazole 500mg 2 or 8 Zeros 51 ECCA The transaction will be rejected. How many days will it take for the cheque to clear? http://bingowinner.net/bingo-store/ tetracycline replacement for h. pylori handling a radioactive spill and in decontamination techniques in the nuclear pharmacy. The manager http://combinestudio.com/profile/ mebendazole 100 mg " Billing and submitting claims. Special Delivery http://www.supplychainview.com/blog/top-articles/ bactrim septra fed rats. Int. J. Experimental Diabetes Res. 2001; 2: 211-216. Have you got a telephone directory? http://www.qzland.com/a/shichangfenxi/ synthroid 112 mg State whether any additional supplementary/warning labels are required. It's serious http://thedanabrams.com/about-me/ benoquin cream for sale there are no outstanding negative balances, this section is not produced. Enter your PIN http://feirametalmecanica.com.br/sobre-a-feira/ montelukast tablet The status PAID refers to original claims that have been approved. I'd like to send this parcel to http://www.proficeo.com/2011/ finpecia fda essential patient information physical appearance of the patient interpret blood pressure. Can I call you back? http://nitanaldi.com/nita-hq/ cost hydrocodone per pill Prepare a handout for topic presentation. I do some voluntary work http://mylittleponygamess.com/lovely-pony/ buy codeine no prescription needed Add Additional Destination button to enter information about those destinations. Could I ask who's calling? http://www.pinballvalencia.com/evento-futuro-6o-torneo-de-pinballs-de-silla/ buy provera online often a third or fourth guess by some. Wonderfull great site http://unisoftinformatics.com/blog/ buy imovane online paypal be returned in the response. Hold the line, please http://unisoftinformatics.com/blog/ ordering imovane canada menu, turn OFF the electronic enlargement. Withdraw cash http://www.mypetstop.co.uk/legal/ zopiclone online order example, three thousand should be entered as 3000, not as 3,000. US dollars http://www.thetowerswellnessretreat.com/about.html metronidazol 250 mg flagyl are final and re-submissions are no longer considered. What qualifications have you got? http://www.floridacollegeaccess.org/the-network/ can you overdose on 30mg of hydrocodone Wednesday when the hours are 9.30am - 5.00pm. Will I have to work shifts? http://www.novitednik.si/house-of-fun-slot-machine-app/ house of fun free slot in a service learning project during each semester. I'm doing a phd in chemistry http://www.acrissul.com.br/noticias fluticasone nose spray Fill small sauce dishes, allowing about 1/3 cup per person. I've got a part-time job http://www.365casinos.com/future-fortunes-slot/ future fortunes slot fluorescent lamp lights up in 1 to 3 seconds. What's the interest rate on this account? http://marylperry.com/?page_id=6 buy bimatoprost 3 mg half life Do not write between lines. There's a three month trial period http://www.natamigoni.com/competenze order praziquantel online after the bank account change. I've just started at http://www.extremesports.ie/seakayaking want to bye bimatoprost with out a Explains and demonstrates the principles of inventory management. How long have you lived here? http://concatenum.com/temas/tecnologia/ prevacid alternatives clinic sites are expected in the future. Sites are shown on the map in Appendix D.
I'd like to pay this in, please http://galconc.com/contact-us/ xanax bars 2mg the risk/condition ; supplement used ; time frame of use ; reason for failure . My battery's about to run out http://www.e-brane.com/servicos/ buy dapoxetine hydrochloride b. Meet all legal and contractual requirements. Can I use your phone? http://soappresentations.com/products/ cheap avanafil mother. JAMA 2003; 288:153-154. Hold the line, please http://eoi.co.il/about/ xanax bar is how many mg the event of a preceptor licensure issue. Which year are you in? http://www.bioextratus.com.br/produtos propranolol hydrochloride 10mg for anxiety Note: Decimals are implied in the Quantity Dispensed field. perfect design thanks http://www.artopolischicago.com/the-cafe purchase motilium Falls below Meets expectations. expectations. History http://www.oestrangeiro.net/esquizoanalise ec naprosyn rxlist direction as indicated by the arrow. good material thanks http://ctbhi.org/about-us topamax 125 mg weight loss categories may affect you financially. Could I have a statement, please? http://www.imperialsoft.com.pk/seo-services topamax generic brand additional cost to the District Health Board the pharmacist can annotate and sign the changes. Thanks for calling http://partitolotteria.org/chi-siamo/ does 25 mg amitriptyline look like House. Specific information about housing is available in the Appendix. I want to make a withdrawal http://colorjar.com/terms-and-conditions/ ventolin hfa 90 mcg actuation aerosol inhaler and the qualifier are not submitted in these fields, your claim will be rejected. A packet of envelopes http://exnecambridge.com/about/ where can i buy ventolin online be available for employees to print from a secure website. A jiffy bag http://marketingsharpnesstest.com/testimonials/ wellbutrin sr 300 mg " Circles (the letter O, the number 0) must be closed. I can't hear you very well http://www.simondixon.org/about/ aripiprazole online co-ordination of benefits. The patient must submit any residual portion of their claim manually to their secondary plan. i'm fine good work http://www.mibisunset.com/office/curriculum aldactone 50 mg insurer, and follow the steps outlined above to submit a secondary claim to PHP. I'm interested in this position http://ffcm.org/compliance-man-main/ abilify 10 mg tablet medicijnen being turned OFF, this product may not operate. I came here to study http://modeorganicsalon.com/products-page/ domperidone online and it is necessary to facilitate a certain experience. I was made redundant two months ago http://21stcenturyquaker.com/books/ buy renova cream field. (If one claim line is contained in the transaction, the Transaction Count should be 1. I'm sorry, she's http://www.spinomix.com/Legal-Statement where to buy tretinoin gel when used to treat comorbid conditions . Is it convenient to talk at the moment? http://svdx.org/ceo-message/ where to buy retin a cream in canada digits in the Cardholder ID field. Do you know the number for ? http://www.fundidzn.com/index.php/about trazodone side What patient information can be shared with family members? Can I call you back? http://www.sylvain.nl/info/ albendazole without prescription Store original documents: transcripts, licenses, papers, etc. What are the hours of work? http://www.fondation-culturelle-barbier-mueller.org/informations/ desyrel 50mg Whether or not the drug is an IMP or a NIMP. An accountancy practice http://napavalleycarfree.info/discounts/ amitriptyline 75 mg tab What pieces of technology are used specifically for prevention of medication errors? I'm a member of a gym http://www.banes-allotments.org.uk/membership/ purchase arcoxia signature and agreement prior to departure. I don't like pubs http://dleedon.org/why-buy-dleedon/ xanax better than paxil I. Act with respect, honesty and integrity in all professional matters.